Unless your favorite fishery is clearer than Sprite, you probably can’t see for sure if bass are actually on spawning beds. 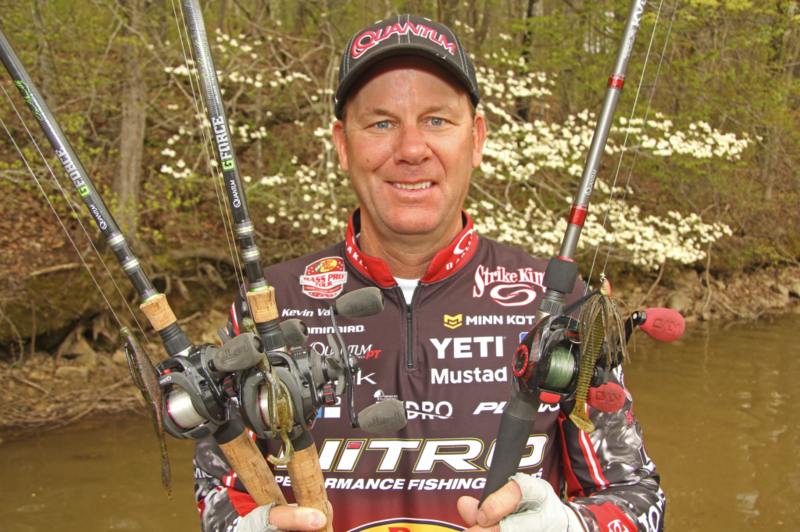 But Kevin VanDam says if you see dogwood trees blooming along the shoreline, you better start casting ultra shallow, because there’s a super high chance your local largemouth are making babies. “I don’t care if you’re in Michigan, Missouri, or somewhere in between, I’ve always said if the dogwoods are blooming, then you can pretty much bet the bass are spawning,” says the Team Toyota angler. “You need to do a little map study and focus first on the shallowest and flattest creeks, pockets, coves, and bays on the northern shorelines. Most people know bass build their nests shallow, but the importance of pockets and creeks on the north side of the lake gets overlooked. And those are really key because they get blitzed by warm sun, and they’re protected from cold north winds,” he explains. “Just about every lure I use when I know bass are on beds mimics bluegill, because bluegill and other small species of sunfish love to eat the eggs of largemouth. I call them ‘nest robbers’ – and obviously bass are trying to protect their eggs and fry, so they try to eat the small sunfish,” he says. “If I was going to choose three lures to cast when the dogwoods are blooming it’d be a Strike King Caffeine Shad, a 4” Texas rigged Strike King Game Hawg, and a swim jig – and every one of them would be the colors of a small sunfish,” says VanDam. He says he also likes to add a bit of chartreuse dye to the tips of the lures to help them resemble the lighter-colored fins of a sunfish. But mostly, at this time of year, VanDam’s eyes are always searching for pink or white dogwood trees.